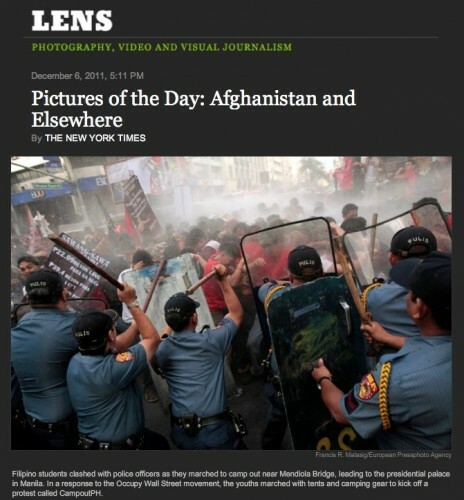 One of the world’s premiere and trusted newspaper, the New York Times, has picked the photo of a Photoville International member for its Lens Blog. The photo, posted Dec 6, 2011 at 5:11pm, shows the clash between the police and militant students who staged a rally in response to Occupy Wall Street in New York. Filipino students clashed with officers as they marched to camp out bear Mendiola Bridge, leading to the presidential palace in Manila. In a response to the Occupy Wall Street movement, the youths marched with tent and camping gears to kick off a protest called CampoutPH.